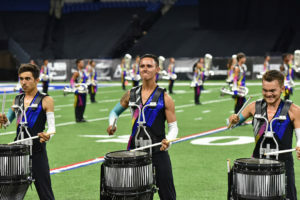 Vanguard and the Blue Devils finished in 1st and 2nd place during the 2018 Drum Corps International World Championships in both World Class and Open Class while Bluecoats and Gold rounded out the top three respectively. 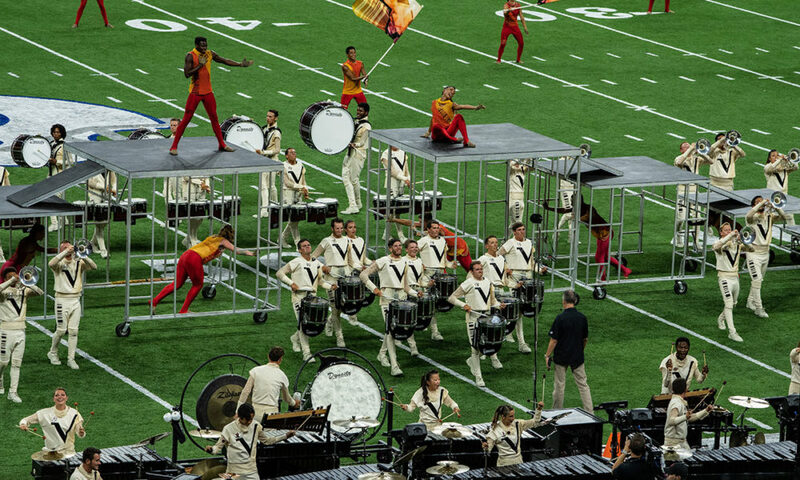 In the 2018 Drum Corps International (DCI) World Championships, California corps showed off their musical and visual skills, with five of the six World Class and Open Class medalists originating from the Golden State. The corps tackled deep-meaning performances and shined light on topics including the importance of communication, inclusion, and treasured time with loved ones. 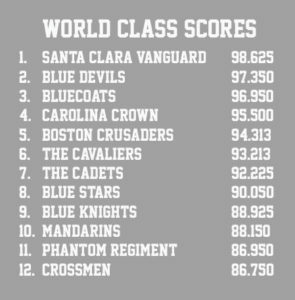 After 19 years of consistently improving and striving to reclaim the top pedestal, Santa Clara (California) Vanguard won its first DCI World Class championship title since 1999 with a score of 98.625. 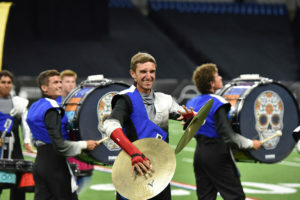 Vanguard has won seven DCI championships overall. 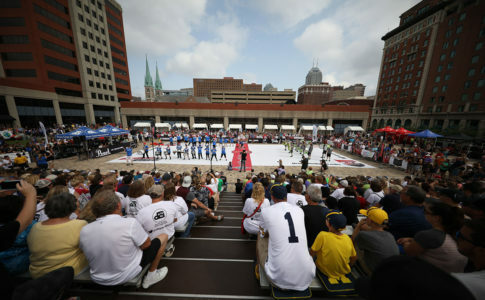 Vanguard had been battling with the Blue Devils (BD) over the last couple of years, finishing second to BD last year. Along with that gold medal, Vanguard nearly swept the caption awards, receiving the Donald Angelica Best General Effect, Fred Sanford Best Percussion Performance, John Brazale Best Visual Performance, and Jim Ott Best Brass Performance Awards. 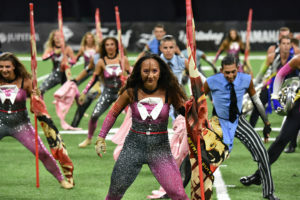 The Boston Crusaders, which placed fifth overall, received the George Zingali Best Color Guard Award. For his role in leading Vanguard to the top in just the second year in his current position, Gallant won the Dr. Bernard Baggs Leadership Award. Creating a modern-day version of the ancient Mesopotamian kingdom through its sets and costumes, Vanguard’s show—“Babylon”—focuses on the importance of communication and working together to build a city from the ground up. 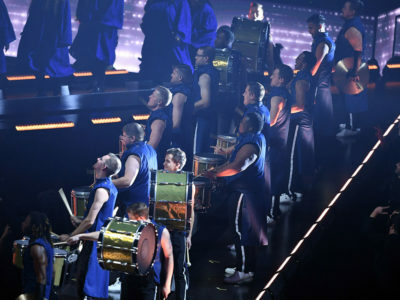 Performers used silver multi-tiered platforms to help construct that village, and the show included dynamic songs like Peter Gabriel’s “My Body is a Cage” and Peter Graham’s “Journey to the Centre of the Earth” along with a dance break. Carl Huang says that he will always remember the energy that erupted from this show into the audience. “Seeing everyone on the field push to the very end of the production, and hearing everyone in the crowd leap out of their seats before we were even halfway done with the closer was beyond anything I had ever experienced as a performer,” Huang says. While the performers may not understand building a city, they know all too well the hardships that come with communication and societal pressures, which made it easier for the musicians to grasp the concept of the show, Gallant says. 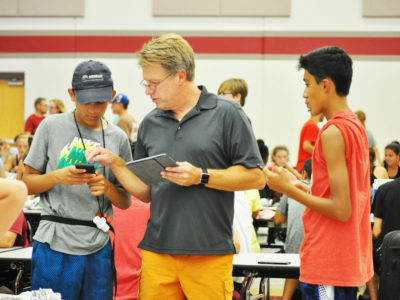 Communication is also something Santa Clara Vanguard staff members emphasize, especially in youth safety and protection. 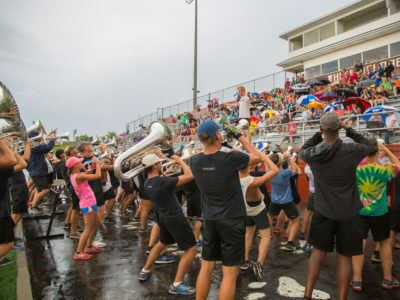 As the drum corps activity evolves and updates to provide safer environments and conditions for members, Vanguard continues having open conversations to make sure “everyone is comfortable about every topic and they know who to speak to,” says Charles Frost, executive director for the Vanguard Music and Performing Arts organization. 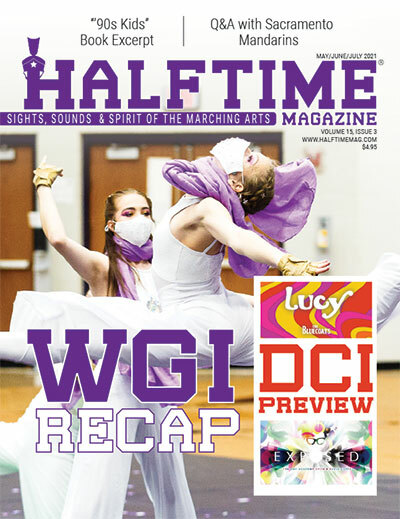 While the corps continued its competitive energy, this season was not without hardships. The group’s food truck was totaled in an accident in July, which could have been a season-ending incident for some corps. 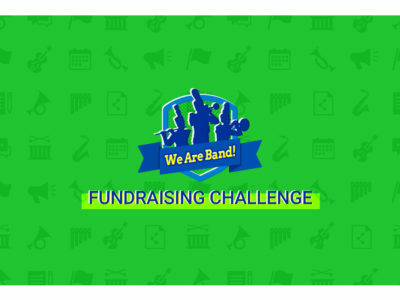 However, the ensemble persevered through this struggle, with the help of the drum corps community, Gallant says. 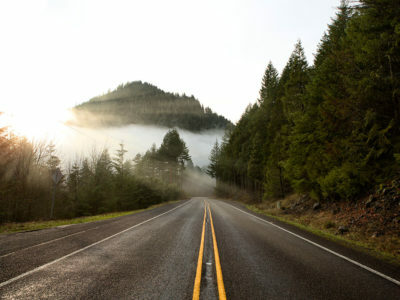 “We were able to turn what could have been an extreme negative into an extreme positive,” he says. With perhaps one of the most complex shows in its history, the Blue Devils from Concord, California, took the silver medal for its show “Dreams and Nighthawks,” scoring 97.350. 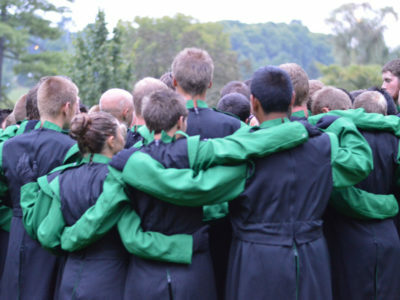 This season continued the corps’ impressive 12-year streak of being in the top two. The Blue Devils reconstructed a 3D version of the famous 1942 Edward Hopper painting “Nighthawks,” which shows people in a late-night downtown diner. 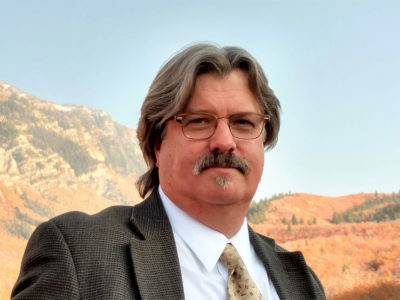 What set this show apart from previous years, Seidling says, was not only the American mid-century music from artists like John Adams, James Newton Howard, and Aretha Franklin but also the depth of characterization the members took on. Hopper never explained the people’s backstories, leaving it up to the viewer’s imagination, something that the Blue Devils played upon. While painted panels created a blown-up replica of the famous painting, the characters inside that art came to life on the field. While the personification added uniqueness to the show, creating props and costumes was the biggest challenge. Since the corps wanted to be authentic to the original artwork, the set and costume designers went to work matching the props to the painting while giving the corps the flexibility to transport them on the field and in a semitruck. The colors of the painting also had to be cohesive with the costumes, Seidling says. In addition, the Blue Devils as a whole had more new members than veterans this season. Color guard captain Alyssa Citero says that all members had to maximize their potential and tap into their storytelling skills. 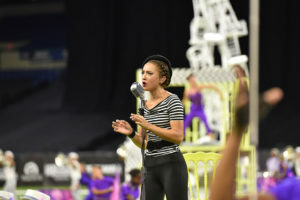 Though 22 of the 44 color guard members were rookies this year, the choreography challenged everyone’s skills, and no one could hide during the show, she says. Rounding out the World Class category at third place with a score of 96.950, the Bluecoats from Canton, Ohio, was the sole non-California drum corps to place in the top three of the World Class and Open Class categories at the 2018 DCI World Championships. Ending the season with a bronze medal was a “proud” accomplishment that rewards the corps’ hard work this year, says David Glasgow, the corps executive director this season and dating back to August 2003. 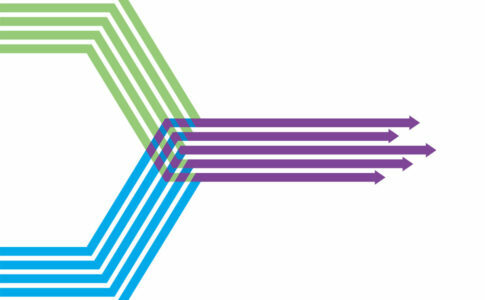 The Bluecoats’ show, “Session 44,” was inspired by Billie Holiday’s recording of “God Bless the Child” as well as its own 44th season, but the show tells the overall artist’s journey—whether in music, literature, or art—from the anxious dives into the unknown when creating new pieces to the excitement when his or her hard work pays off. For some performers, the personal connection to the show was rooted even deeper. Oliva says that the English folk ballad “Saro” stood out as her favorite musical number. 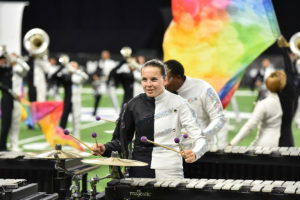 “Saro” is more than just a ballad about a man in love, she says, as it also describes her connection to the drum corps universe. 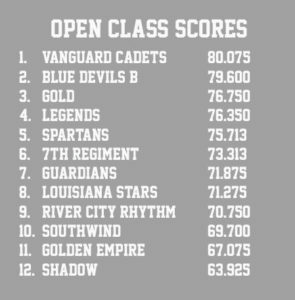 The Vanguard Cadets earned the Open Class championship for the second year in a row, taking home the gold medal with a score of 80.075. They also received Best Brass Performance, Best General Effect, and Best Percussion Performance awards. 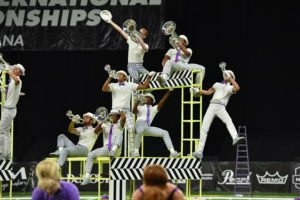 Featuring songs like Queen’s “Bicycle Race” and Eric Whitacre’s “Fly to Paradise,” the Vanguard Cadet’s “Off the Wall” show taught the audience to expect the unexpected and push their imaginations. 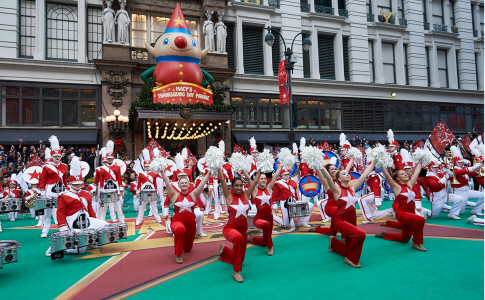 The Cirque du Soleil-style performance included a dance break and sudden movements that required flexibility, making the white, orange, and black one-piece uniforms ideal. 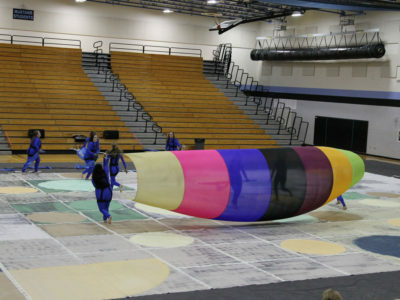 A multi-piece uniform restricts performers’ movements and limits the visual capabilities while the one-piece made almost any visual possible, Barnhill says. Compared to last year, the corps was more confident in its overall package, Barnhill says. 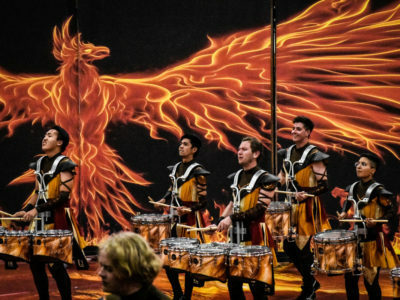 The Vanguard Cadets revamped its visual package last year about midway through the season, creating a stressful scramble. Only 0.475 separated the Blue Devils B (BDB) from the Vanguard Cadets with BDB finishing second with a score of 79.600 for its show, “The Other Side.” The corps also took home Best Visual Performance and Best Color Guard awards. 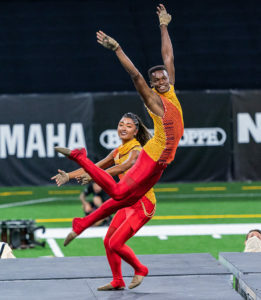 While proud of the silver medal, BDB staff coordinator Chris Nalls says his main pleasure emerged from seeing the corps’ growth—from bumping into each other during those first rehearsals to executing complex visuals and music through the season. “What I remember the most is … being at the top of the stands as they finished the show and feeling the tears start to swell up because we had come so far,” Nalls says. “The show celebrates that one time where everyone can get together and be together, whether it’s in memories or in reality,” Nalls says. Founded in 2005 by Donald Flaherty, Gold received its first Open Class medal with a score of 76.750. 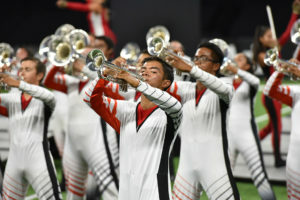 “Once they called that Gold got third place, you got a feeling of, ‘Oh my gosh, all of this work we’ve put in through the summer, all of those long nights finally paid off,’” says trumpet player Chris Mora. Trying to show the audience what the world looks like to someone with special needs, Gold performed “Through Our Eyes,” using original music by Scott Director. 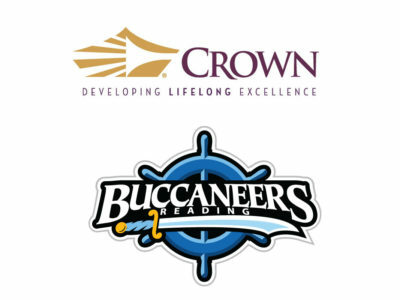 The group’s black and white uniforms and colorful flags showed the wide range of ways that individuals with special needs see their surroundings. Gold also received the Most Improved recognition. Photos courtesy of Ken Martinson/Marching.com and Ron Wyatt.